Prepared with leftover cooked pork, the smoky sweetness and tangy crunch of these delicious sandwiches will make you wish every dinner was made with leftovers! Combine coleslaw blend and dressing. Mix mayonnaise and barbecue sauce until blended. Spread mayonnaise mixture onto 4 bread slices. 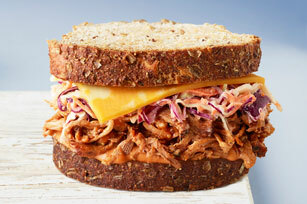 Cover with meat, coleslaw, cheese and remaining bread slices. Substitute your favourite Kraft Vinaigrette Dressing for the Coleslaw Dressing. Brighten the flavour of the coleslaw by adding a shredded apple. This a great way to use leftover cooked pork.